Ground-covering plants have become especially popular with aquascaping. A dense, vital carpet of Hemianthus callitrichoides "Cuba" or Glossostigma elatinoides is impressive and brings a lot of atmosphere to a layout. Meanwhile, many different species of ground-covering plants have become available, like e.g. Eleocharis sp. 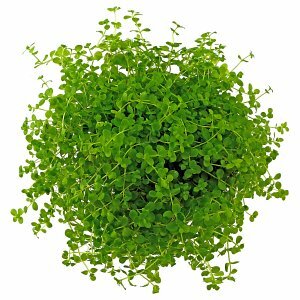 "Mini", which is used to create dense lawns with fine leaves, or Marsilea crenata for colourful plant carpets. They provide aquascapers with manifold options for attractive foreground layouts. Ground-covering plants differ in their speed of growth, their colours and their requirements. You have many options, from easy-to-keep plants to those whose cultivation is very difficult. Some easy-to-cultivate ground-covering plants are e.g. Glossostigma elatinoides or Micranthemum sp. "Montecarlo". Species of the genus Marsilea are also quite undemanding, however, their colour is of a far darker green, and young leaves are beige to brownish. Eleocharis sp. "Mini" or Eleocharis parvula are two different hairgrasses. 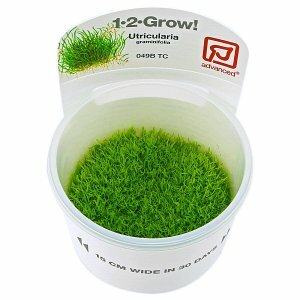 Both are suitable for creating very low-growing lawns in a layout. 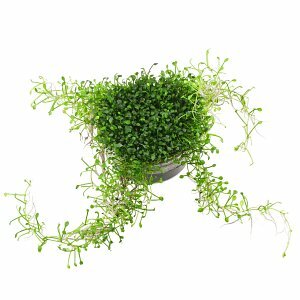 Low-growing aquarium plants, creating dense carpets via offshoots and creeping shoots are suitable as ground cover. Their classic place of use in aquaristics is the aquarium foreground. With aquascaping, ground covers have gained great importance in aquarium design. Particularly in minimalist Iwagumi style layouts, a low, extended plant cover is an element that, together with the dominant stone composition, makes a decisive contribution to the overall impression. Here ground covers can make up most of the vegetation and extend to the background of the aquarium. The spatial effect is enhanced by modelling the substrate; ground covering aquarium plants also contribute to the stabilization of sloping substrates. Depending on the type of plant used, a ground-cover carpet shows different textures and colours. It can sometimes create the impression of a mountain meadow with fine-stalked grasses or cushions of small-leaved mountain plants. In uniform ground cover areas, interesting accents with contrasting colouring and structures can be set with other low aquarium plant species. 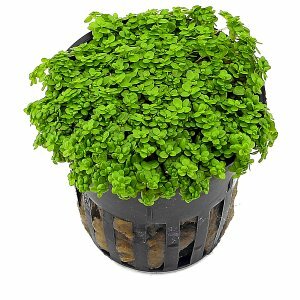 In our online shop we offer a wide range of ground cover plants and other small aquarium plants. Many species can also be bought from us as in vitro plants, which offer a particularly profitable quantity of young plants per cup, ideal for planting a larger area. 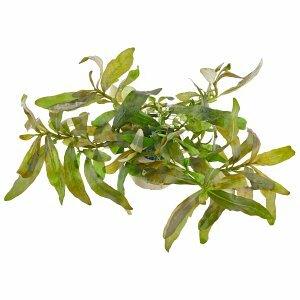 Most aquarium ground covers are natural pioneer plants, spreading on naked mud-, sand- or gravel substrates like along tidal river shores, sandbanks or the bottoms of drained ponds, often in full sunshine. They're amphibian aquatic plants; depending on the current water level, they can occur above water (emerse) or submerged (submerse). These species are usually weak in competition in nature and are easily forced out by larger aquatic- and marsh plants. In the aquarium, most groundcovers need an unshaded, well-lit place. A nutritious soil, e.g. aquasoil, and a good nutrient- and CO2 supply are very beneficial for them. 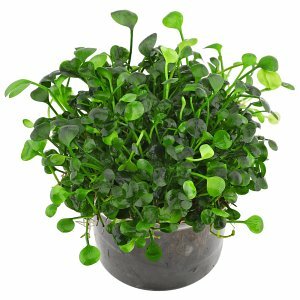 However, there are also some frugal ground-covering aquarium plant species that grow well under moderate lighting and low carbon dioxide concentrations. 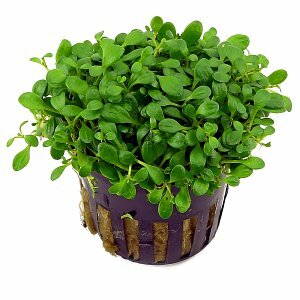 The probably most popular groundcover for the aquarium and at the same time the aquarium plant with the smallest leaves is the dwarf baby tears, Hemianthus callitrichoides "Cuba". If you meet its requirements for light, CO2 and nutrient supply, the finely-textured, bright green pads and carpets of the "HCC" are a real feast for the eyes. The small mud mat, Glossostigma elatinoides, also has roundish but slightly larger leaves. 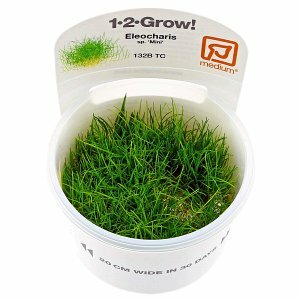 It is already a classic made popular by Takashi Amano as a very low ground cover for nature aquariums. Glossostigma is moderately challenging and spreads rapidly with creeping shoots, good lighting conditions provided. An excellent, simple ground cover for almost any freshwater aquarium is the Montecarlo pearlweed from southern South America, Micranthemum tweediei, introduced under the name Micranthemum sp. "Montecarlo-3". Unlike the bushy Micranthemum umbrosum, it forms a compact, flat carpet; planted in an elevated position, the shoots grow downwards. The mini hairgrass Eleocharis sp. "Mini" and Eleocharis pusilla with their almost hair-thin stalks provide a "meadow effect". They penetrate the substrate with many thin runners and thus form dense, bright green lawns, which usually remain lower than 10 cm. The hairgrass (Eleocharis acicularis), which is also native in Europe, is very similar to them, but becomes considerably higher with time. It is also recommended for cold water aquariums. The chain sword plants (Helanthium, formerly counted to Echinodorus) live up to their name, as they send long runner "chains" with countless young plants over the ground. In the underwater form they are also narrow-leaved and grassy, especially the South American Helanthium tenellum, which also shows reddish tones when exposed to much light, and the light green H. tenellum "parvulum" from North America. Wider, light green leaves are found on the variants of the Bolivian chain sword (Helanthium bolivianum) like "Latifolius" and "Quadricostatus" from tropical America. They are simple, fast-growing aquarium plants that do not require too much light and are also recommendable for first planting or aquarium beginners. Ranalisma rostratum from tropical Asia develops into a very decorative light green lawn under water, very similar to the American Helanthium tenellum "parvulum" but remaining even a little smaller. This little known frog bite plant grows quite quickly under good lighting conditions and sufficient CO2 and nutrient supply. The narrow-leafed arrowhead Sagittaria subulata "Pusilla" has long been known in aquaristics. It has very few requirements and still grows in tanks without CO2 fertilization, hard water, and even in cold water aquariums. With dense planting, little light and high macronutrient and CO2 supply, however, it can exceed 15 cm in height. It forms dense stands with its sub-substrate shoots. The Brazilian grass plant Lilaeopsis brasiliensis spreads rather slowly. It has also been in use in aquariums for a long time and does not have high requirements. Due to a confusion with Lilaeopsis novae-zelandiae it is also popular among aquarists under the name "New Zealand grass". To plant an area with a ground cover, it is best to divide the plant material into small portions or individual plants and place them at some distance from each other in the aquarium substrate using plant tweezers, distributing them over the desired area. The plants then grow together into a closed mat by means of their runners or creep shoots. We describe this in more detail in this article. In the article we also describe how an older ground cover should be cut back or thinned out in due time, because otherwise the carpet will become too thick and eventually detach from the substrate.